It's very unlikely the Rockman Unity app will come stateside in any official capacity, but that shouldn't stop you from enjoying it. Thanks to the gracious efforts of Replioid_21XX, you can download the .apk file right here. Don't worry; the app itself is free. This way you can skip the hassle of setting up a Japanese Google Play account. Also, here's that fantastic wallpaper by Shinkiro in three sizes: 640x960, 750x1334, and 1080x1920. Normally this wallpaper is won by "defeating" Cut Man in-app. But hey, here it is. Thanks again, Reploid_21XX! Enjoy, guys. Really cool wallpaper, to bad is only for phones and not PC. I wonder if they will give more wallpapers with new artwork when the new bosses drop. Thanks for sharing the good spirit. 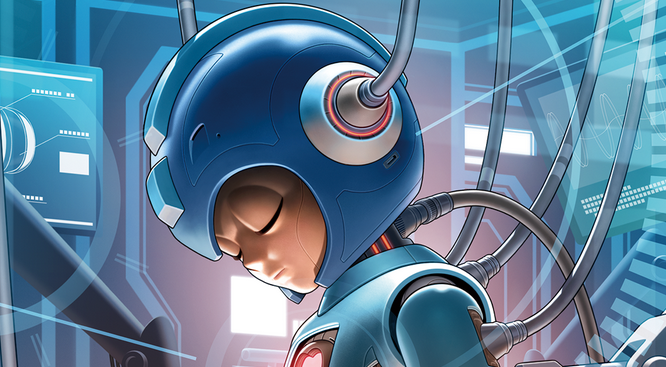 Yeah, there is a ton of megaman games to play, and overall, it's good games. Same with fangames, there is a lot of fangames to try ! There is still some things to do.. Mind you to write a basic tutorial for this app? It's all japanese, I cannot read it. Man Shinkiro's mix of realism and cartoon in recent years lends itself to Mega Man in a freaky and awesome way. The wallpapers are gone. Can anyone re-upload them, please?